Eczema affects one in five adults in the United Kingdom and up to one fifth of children. The term eczema is a blanket term that can be used for all forms of eczema as their as many types of eczema. In a mild form the skin appears dry, and itchy. In severe forms, the skin may bleed. The cause of eczema depends on the clinical diagnosis of the type of eczema. It is imperative that the type of eczema is diagnosed before an effective treatment plan can be implemented. Listed below are the five main types of eczema that affect the feet and legs. This is the most common form of eczema. The skin often appears extremely dry, red and inflamed. The patient may also complain of severe itchiness. Scratching the skin may cause the skin to split, leaving it susceptible to infection. If the eczema is infected, the skin may crack and weep. Atopic eczema is linked with hereditary factors, asthma and hayfever. Patients may also have a sensitive reaction to certain types of allergens in the environment, which may lead to the occurrence of atopic eczema. Treatments include different types of emollients and steroids to reduce the inflammation. This form of eczema commonly appears in adults and can affect the legs and the feet. Discoid eczema appears as small round shaped lesions that can be very itchy and may weep fluid. Treatments include different types of emollients and steroids to reduce the inflammation. This form of eczema is caused by frequent contact with everyday substances such as soaps and shower gels. A patient may experience symptoms similar to that of atopic eczema. This condition can be prevented through avoiding the irritant. This condition is very similar to irritant contact dermatitis. Red, itchy and inflamed lesions may occur due to a material such as cotton, leather or wool. Certain types of washing up powders and fabric softeners may also lead to an attack of allergic contact dermatitis. Ensure that you have the correct blend of emollients and topical steroids. Do not borrow somebody elses creams, as they may be too strong for you. Cotton clothes and bedding will allow the skin to cool. Synthetic fibers and wool can irritate the skin, caution should be taken. 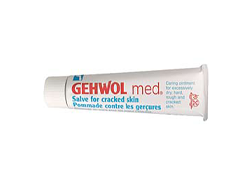 Recommend a cream or topical steroid that will be suitable for your skin. Treat any open cuts or weeping lesions you may have as a result of your eczema. In the case of varicose eczema and the associated complication of varicose ulcers, the chiropodist will apply appropriate dressings to the lesions. Even though we have reached the millennium, there is still no cure for eczema. However, symptoms can be controlled to minimize discomfort and pain. Many children will find that their eczema has cleared by the time they reach their mid teens. An effective skin care regime is essential in order to control all forms of eczema. The skin care regime will be catered around a specific patients need. The term emollient applies to creams, lotions, gels and soap substitutes. Emollients will enable the skin to become less dry, itchy and more comfortable. There is a wide range of emollients available on the market. Trial and error may be necessary to ascertain which emollient is best for you. Your chiropodist and your general practitioner may recommend certain types of emollients. In severe cases, oral steroids may be necessary. Your General Practitioner will prescribe them if your symptoms can not be controlled via emollients and topical steroids. Laser therapy can be used in severe cases. Flexitol Heel Balm treatment combines 25% urea formula with highly concentrated emollient base. With regular use, your feet will become soft and silky smooth to the touch. "I have very dry feet. If I do not moisturize them at least once a day (sometimes twice a day) they dry and crack. I have been looking for the best moisturizing cream to use. 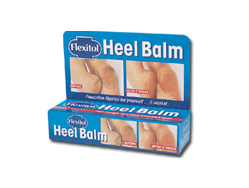 Then I tried your Flexitol Heel Balm and have been using it for 10 to 12 months and it works great. It's really helped especially in the winter. I can walk pain free! Thanks for a great product that does what it claims."